Religion and Politics in Bahrain: Back to Square One: What Has Changed in Bahrain since February? Back to Square One: What Has Changed in Bahrain since February? I debated waiting to post until the results of today's vote were in, but since I'll be traveling--and, more fundamentally, since the actual results will make no difference anyway--I figured I may as well just go ahead now. In this regard yesterday's (and today's, according to organizers) attempted "Return to Marytrs' Square" is instructive. Certainly, the timing and scale of the events of late February are orders of magnitude greater than this latest try at restarting mass protests. All the same, the similarities in response to the events are striking. The main difference seems to be that the police and military have been much more resolute in preempting rather than reacting to planned protests, sealing off the rally paths (which of course are all well-advertised online) before events can spiral out of control. A similar thing happened, to name one other example, with the planned February 14 movement protest outside of the U.S. Embassy back in late July. Bahraini police set up checkpoints and patrolled key roads Saturday in a massive show of force during highly charged parliamentary elections that Shiite-led opposition groups have vowed to boycott. The heaviest security was around Pearl Square in the capital Manama, which was once the hub for Shiite protesters demanding greater rights from the ruling Sunny monarchy. The area was ringed by barb wire and lines of armored police vehicles amid calls by anti-government factions to try to reclaim control of the site. Similar appeals have appeared on pro-government forums (I don't have a Facebook account so I can't speak to that). This thread, for example, posts dozens of photos and says, "My brothers and Sisters, I expect all of you to try to identify these people from the Pearl Roundabout and mention their names, regions, and addresses." One can find similar threads with additional photos as well. Much like the cancellation of student scholarships, harassment of teachers/professors (see the new HRW report on this), mass sackings, trials of doctors and lawyers, and other post-February events, the Bahraini government is also exploring more creative ways to punish those responsible for spoiling their glorious by-elections. An article in Al-Ayam, for example, cites a high-level source as suggesting that monetary and other penalties may be imposed for those who fail in their national duty by refusing to vote, noting that "tens" of other countries around the world have similar laws. Yeah, "tens" of other countries like Kazakhstan and Belarus. In addition, authorities have also threatened prosecution for Twitter and Facebook posts calling for protests and other anti-government activities (including, presumably, electoral boycott), and have banned photography or video-taking "in the vicinity" of polling stations, presumably to mask dismal voter turnout. Really, then, with the indiscriminate use of force against protesters; witch-hunts on Bahrain TV and pro-government social media; and threats of punishment for online activity and electoral boycott; all that is left to recreate the atmosphere of February, March, and April is an op-ed from Yusif Al Bin Khalil claiming that the United Sates and its Iranian ally is trying to overthrow the Bahraini regime. 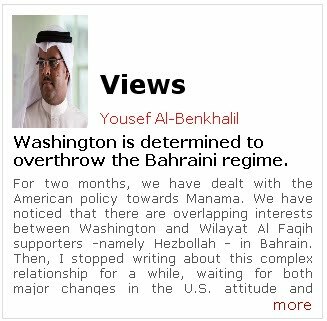 To the U.S., apart from Al Wefaq, other Bahrainis have no demands; their view points and interests are not important. In short, in his speech before the United Nations General Assembly, President Obama summed up the American attitude. He said he would like to strengthen the ties and cooperation with Bahrain. He would like, though, that some change happen, mainly the relating to Al Wefaq demands. Otherwise, how can we can we explain Obama’s statement when he says: “In Bahrain, steps have been taken towards reform and accountability. We’re pleased with that, but more is required.” The expression “more is required” is in my opinion the heart of the American attitude. 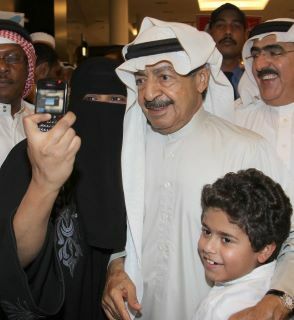 Is the royal family departure required so that Al Wefaq could govern Bahrain? So three little words from Obama--"more is required"--are enough to show government supporters that "Washington is determined to overthrow the Bahraini regime." Al Bin Khalil would have done better to criticize Obama's sentence on semantic grounds, since the notion that "more is required" implies that ANYTHING AT ALL has changed in the first place. Whereas clearly nothing--fundamentally-speaking--has. Thankfully, Glenn Greenwald of Salon offers a more accurate interpretation of these same words from Obama in his tongue-in-cheek article "U.S. not 'standing idly by' in Bahrain." Indeed. And they can't even speak American. @Anon: The Godwin's Law competition? Yeah, I'd say you did. Justin, actually a better translation of that piece from the forum would be, "animals/beasts of the Pearl Roundabout". Look out for Ali al-Aswad's TV debate on BBC with AbdulHalim Murad... It still hasn't been uploaded but it's a matter of time, I suppose.